The difference this time is, Tapped Out actually started off pretty well — unlike Battlefield 3. In fact, EA expected the title to become one of this year’s biggest freemium hits. It allows gamers to build their own Springfield from scratch after a nuclear explosion (caused by Homer, of course) wipes out the town. And a lot of work went into its development, with the show’s writers and actors providing stacks of original content throughout the game. But like Battlefield 3, EA’s servers let it down. 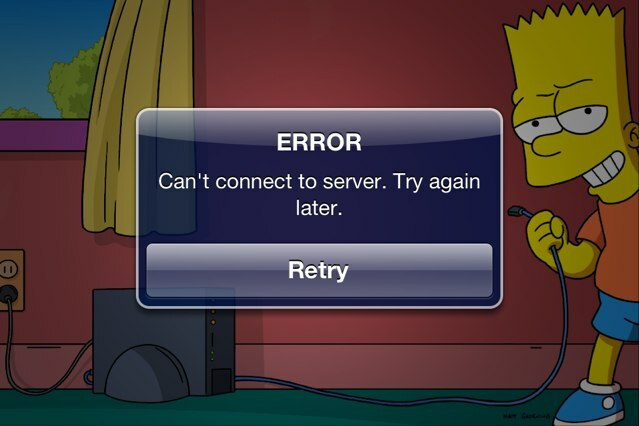 A few days after the title’s release, users found they could no longer log in to their own little Springfield, and when they did manage to get online, they couldn’t manage their town because of the unbearable latency issues. To ensure current players have the best possible experience, we’ve temporarily removed The Simpsons: Tapped Out from the App Store to limit the game’s server capacity to its current players and address connectivity and lag time issues. If you’ve downloaded the game, you can continue to play. Actually, your experience should only improve as we work on a solution. As soon as we have resolved these issues to handle greater player capacity, we will return The Simpsons: Tapped Out to the App Store. It’s a shame that Tapped Out had to be pulled, but it’s good to hear it will be coming back at some point.